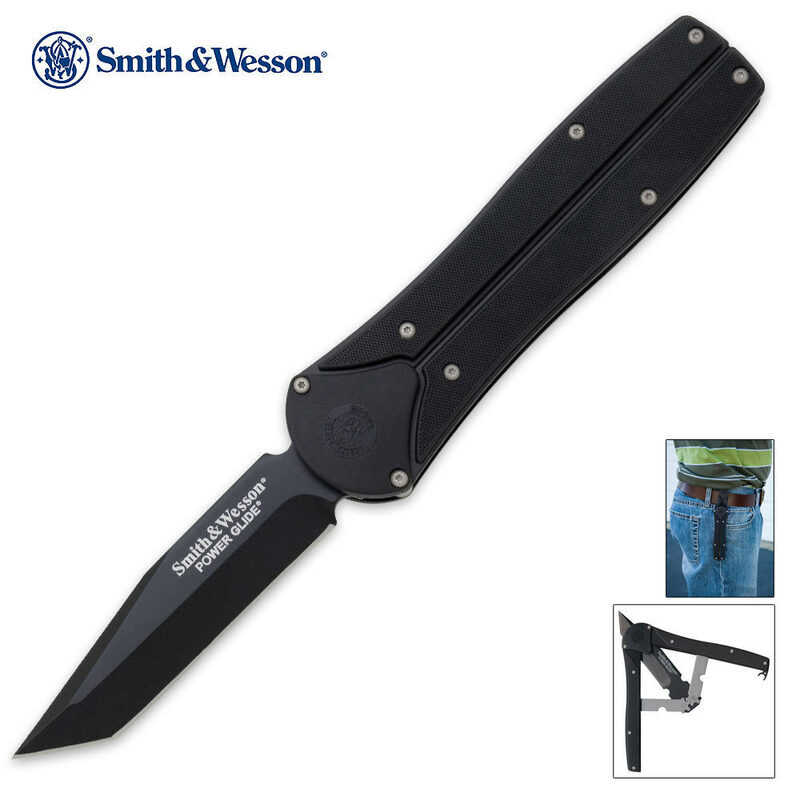 Smith & Wesson SWPGBT Black Tanto Power Glide Folding Knife | BUDK.com - Knives & Swords At The Lowest Prices! Smith & Wesson's Power Glide tanto pocket knife offers a new patented gear system designed to deploy the blade without the hassle of a thumb stud or notch. 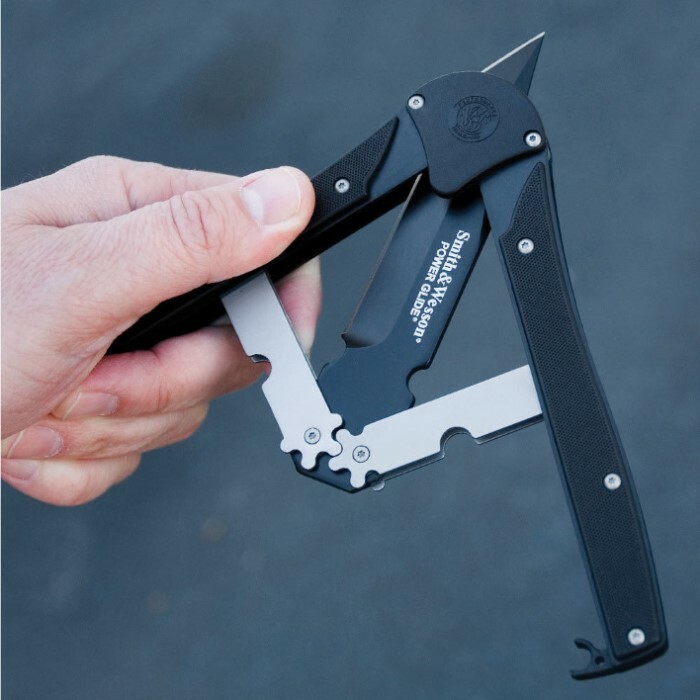 The stainless steel blade and aluminum handle give you an exceptionally designed pocket knife that will provide you with years of good use. Nice design,opens&closes flawlessly it is RAZOR sharp.I love the carry system.I may buy a few more to give to my friends. I LOVE this knife. It's great. It looks and feels like a very expensive knife, it's durable and sharp, it's fun to play with, and it's at an unbeatable price. If you are considering purchase, do it, absolutely. I bought this knife and I love it. Sharp out of the box and it doesn't feel cheap or loose anywhere. My friends love the way it looks and feels too. Awesome Knife, Takes Some getting Used To And Loosening But Overall, Its Better Than Any Folder You Could Find, Its Alot Like A Typical Butterfly Knife Which Is One reason I Bought It, But At The Same Time nothing Like It At All, It Has The Concealability Of A Folder With The Relative Dynamics Of A Fixed Blade, Although Its Nowhere Near A Fast Opener, Its Still A Good Knife, The Only Downside I Can See Is It Has A Traditional Tanto Style Grind To It Being Ground On One Side And Completely Flat On Another. Overall To Me, Great Knife. Pretty sharp out of the box. Not at all difficult to operate. Once it's opened it feels solid, no blade wiggle. Worth the price. Pretty cool knife, bigger then I thought (that's what she said). Individual knife box came dented and smashed, which in result broke the clip. Will call to see if another one can be shipped. BTW LOVE THIS WEBSITE!!! Very interesting knife, took a bit of getting used to but now I really like it. 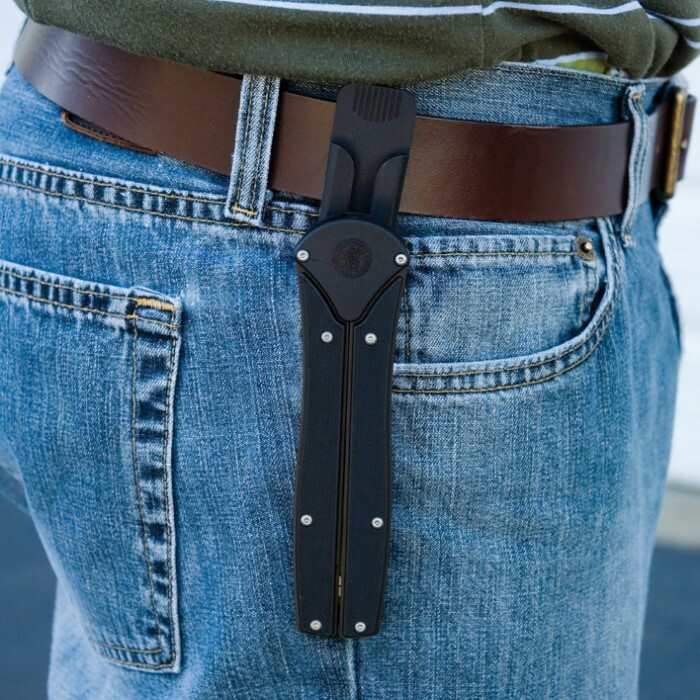 The belt clip does what it was made to do but I wish it was made to hold the knife steady, it's designed to swivel for some reason so it swings all over the place, at least it's removable. The handle is bigger than the blade but I don't mind, something to fit my big hands, though if you're picky about balance this is not your knife. It's got a nice weight to it though to heavy. Nice and smooth motion all the way through and when it's locked it's locked, that blades not going anywhere, not wiggle at all. Overall, 12 bucks can't go wrong. 4 stars because 5 would be perfection. This is a very interesting knife. Very sturdy made. Glad i purchased them to try out in my store.